THanks to Barrie Flemming for the photograph. 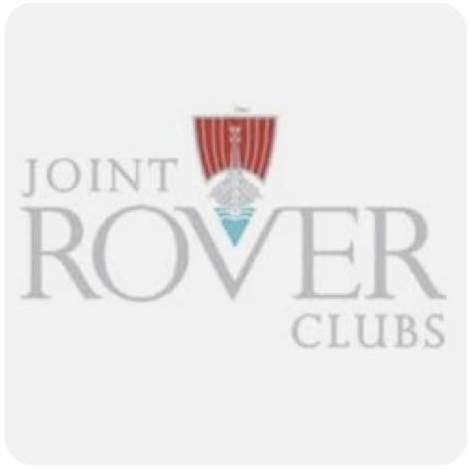 A multi award-winning club with a worldwide membership, the Club is the active Rover P6 owners' club for all drivers and enthusiasts of the legendary Rover P6. 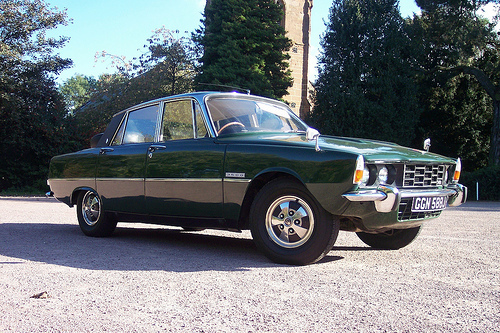 The Rover P6 is perhaps the most technologically accomplished saloon car the British motor industry ever produced. The seven years in development of the Rover P6 yielded innovations that were decades ahead of the mass market. It was also one of the fastest production saloons, the safest, and the most comfortable, making it the defining sports saloon of the era. In today's motoring world, these years-ahead innovations make the Rover P6 a classic car that is as supremely practical as it is desirable. Whether you opt for the design purity of the original breakthrough Rover 2000 models with their sophisticated engines and superb handling, or the all-American burble of the iconic V8-engined Rover 3500 cars, you are investing in a piece of motoring heritage direct from a time when clean-sheet thinking, properly funded experimental engineering, and radical departures from convention were the orders of the day in automotive design. At the launch of the Rover P6 in 1963, the Rover 2000 redefined the capabilities of the saloon, and invented the 2-litre luxury sports saloon market now dominated by the likes of the BMW 3-series. Engineered crumple zones, power assisted disc brakes on all four wheels, and a radical independent suspension specifically designed for radial tyres, were just some of the innovations that won the Rover P6 the first ever European Car of the Year award in 1964 and AA Gold Rosette for Safety in 1967. But it wasn't all cautious motoring. The legendary 3.5-litre aluminium V8 engine propelled Rover P6 performance into the supercar territory of the day. Even by today's standard, the Rover P6 V8 models are fast cars. All of these factors coupled to favourably affordable prices and superb spares availability makes the Rover P6 one of the most practical and attainable choices of performance classic cars for the modern world - many are used in daily traffic. The Rover P6 Club is a multi award-winning owners club dedicated to supporting the owners and enthusiasts of the exceptional and groundbreaking Rover P6 with a comprehensive support network of local events and activities, free expert technical advice, established relationships with key parts and service suppliers, and access to a global family of networked Rover clubs. 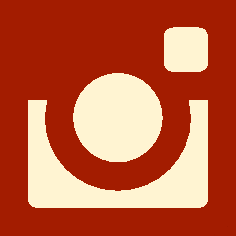 We are proud members of the Federation of British Historic Vehicle Clubs and Joint Rover Clubs, and attend all of the major national classic car shows including the NEC Classic Motor Show, Practical Classics Restoration Show and Stoneleigh Restoration Show. 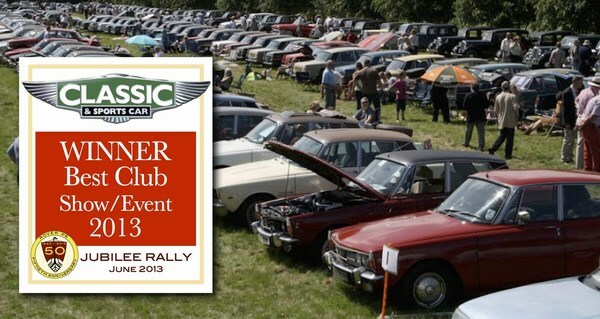 2013 - Best Club Show/Event - Won jointly with the Rover Sports Register for our 2013 Jubillee Rally celebrating 50 years of the Rover P6 and 20 years of the Rover P6 Club. 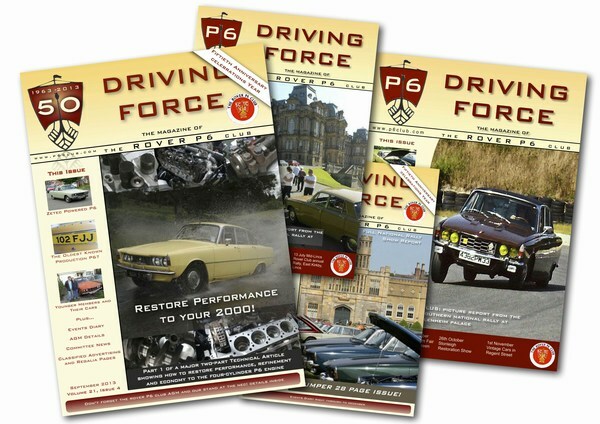 DRIVING FORCE, the bi-monthly full colour A4 glossy magazine published by the Rover P6 Club has been awarded Club Magazine of the Month by both Practical Classics and Classic Car Weekly magazines, and some of our Committee have been nominated for the Club Heroes award by Practical Classics. The Rover P6 Club has an active and vibrant selection of regional branches covering the entire United Kingdom, as well as two National rallies (Northern and Southern) each year. 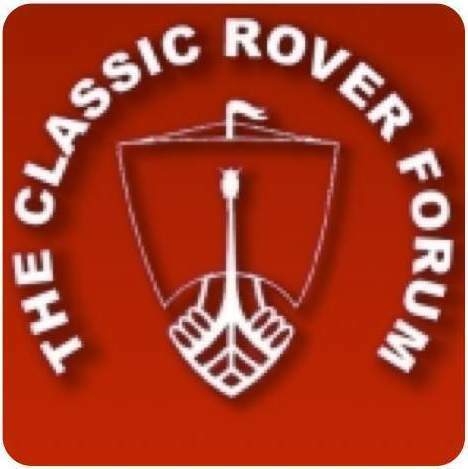 We have a strong presence on social media, including Facebook and the Classic Rover Forum. Membership of the Rover P6 Club entitles you to insurance discounts with select insurers, we have a bespoke under-21s insurance scheme, and some of the lowest annual membership fees of any one-model car club - just £25 a year for a UK resident. The Rover P6 Club is a true classic car club governed by an elected committee of volunteer members and run on a not-for-profit basis. We are proud to count amongst our members many of the original design team who developed the Rover P6 in the early 60s, and have dedicated archivist contributors to the magazine who are unearthing lost information on the Rover P6 from the Heritage archives to further add to the Rover P6 story. Joining the Rover P6 Club is easy and can be done online. 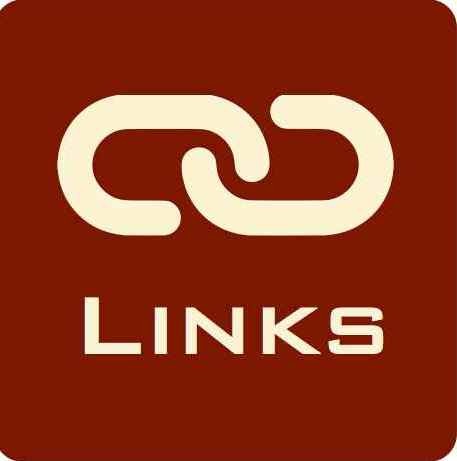 We are always willing to offer help finding or viewing a car, even to non-members. 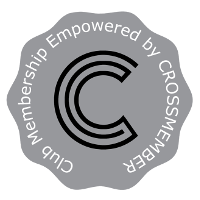 Have a look around the website to learn more about this fantastic award-winning club and the groundbreaking car we support.